Countless Americans take a considerable amount of pride in the appearance of their lawn. Green grass accents a home in a way that cannot be described. The picture-perfect yard doesn’t come without a little bit of lawn care work. In order to have that magazine cover lawn that makes all of your neighbors jealous, you’ll need to make one of two different investments. You’ll either need to invest some time (and money) or invest money into having someone else do the work for you. Lawn care can be both valuable and enjoyable when you see results. 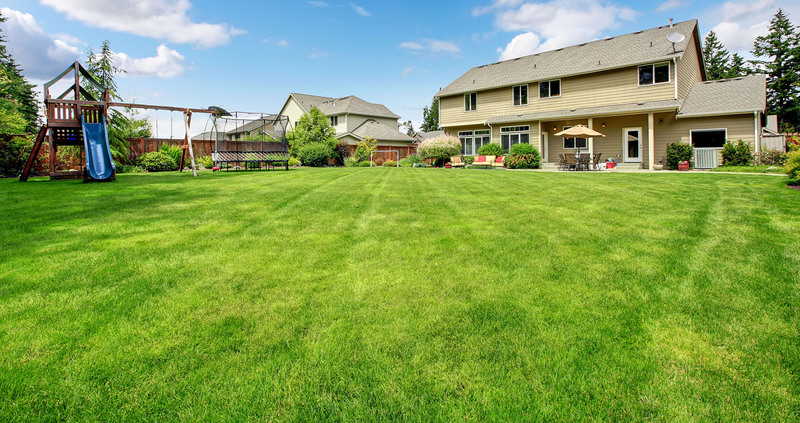 The benefits of a well-kept lawn vary greatly. With proper care, your yard can be a sanctuary for wildlife. It can increase your house’s curb appeal, not to mention it’s value. A beautiful lawn can bring a sense of accomplishment. Lastly, I find lawn care to be strangely therapeutic (but maybe that’s just me). This guide will outline the details of creating and maintaining a perfect lawn. It’s going to describe the processes, reasons, and schedules for all of the various elements that go into lawn care during a calendar year. The beautification of your home’s landscape should start before the first mow of the season. If you are serious about your yard this year, get these tasks done before the sun starts shining and the grass starts growing. If you have a sprinkler system, make sure you have it started up (hopefully you had it winterized). Sprinkler winterization is a process of removing the excess water from pipes, valves, and sprinkler heads. Without removal, water can freeze and cause unwanted damage to a sprinkler system. Starting your sprinkler system up yourself is possible, but we usually recommend hiring a professional to come out and do the job. Especially if you had a professional winterize your system. If you are past the freezing season in your area, get the task done early. The first couple weeks after the final freeze are usually pretty busy for landscaping companies. Plan it for the beginning of spring so you can have your sprinklers ready to water once it heats up. One tip: if you decide to start the system up yourself, remember to turn the water on slowly. Turning the water on too quickly can potentially damage your pipes. Along with your yard, your lawn mower is an investment. Protecting investments is more cost-effective than recovering them. A lawn mower is a machine, and machines need maintaining. Complete some basic upkeep tasks. First, you should drain the fluids from your mower. Drain the oil, because that will likely need replacing after last year’s use. Next, remove the gas. Fuel builds up moisture while it sits in a tank, so draining it gives you the chance to start fresh. Next, you should remove the spark plug. Removing the plug will keep the engine from starting and prevent any accidents from happening. While the gasoline and oil are drained, flip the mower to check the blades. At the very least, you will want to sharpen your blades. Sometimes they are beyond the point of repair, and it’s time to get new ones. While you still have the mower flipped, clean underneath the deck. Over the course of a summer, grass can build up on the bottom of the mower. After that’s done, refill the mower with new gas and new oil. It will help with starting up your mower and might even increase your gas efficiency. Lastly, replace the spark plug. Since this is inexpensive, some people do this yearly. We think that replacing it every two years is sufficient. 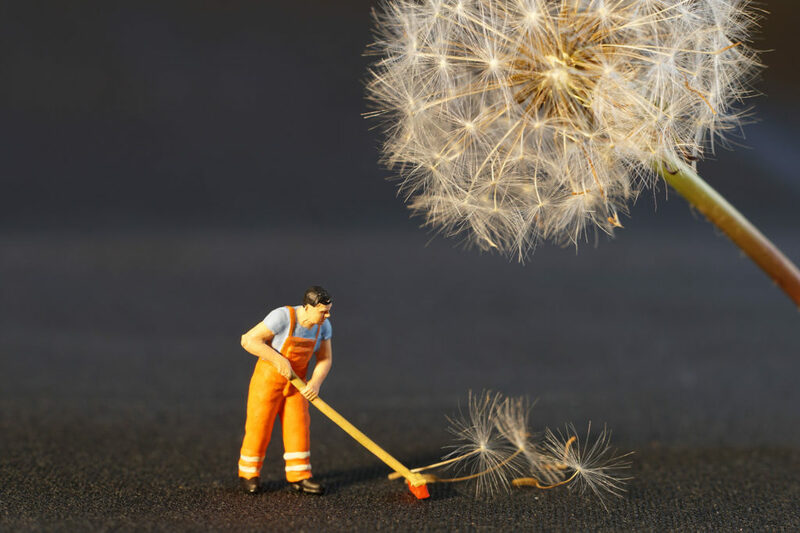 You’ll want to clean up your yard. Depending on where you live, winters can be tough on a lawn. Maybe there are some broken branches that fell, extra leaves leftover from the fall, ground-bound pinecones, or presents from your neighbor’s dog. No matter what it is, you should rake and remove it from your grass. It will make the upcoming processes much, much easier. Okay, the snow is starting to melt. You have gotten everything ready for spring. Let’s kick off the season the right way. For the sake of the guide, I am going to stick to residential area lawns and yards. Before you start any lawn care program, it’s essential to identify which type of grass you have. 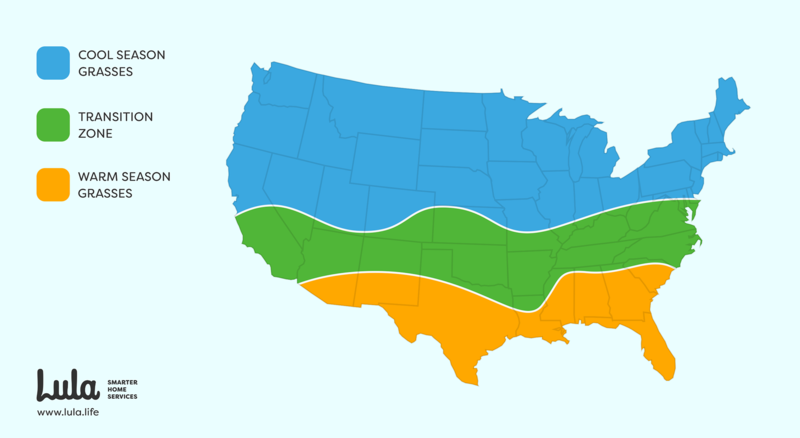 The types of grass found in America are typically split into two different groups: warm season and cool season grasses. Cool season grasses are the opposite. They are used to the cold winters and tend to go dormant during the peak heat of the summer months. Different types of grass require various factors to reach its growth potential. It’s not a secret that grass needs water, oxygen, sunlight, soil, and nutrients in order to grow. As time goes on, something called thatch begins to build up. Thatch is a combination of roots, grass, and stems that compact to form a dense layer in between the grass and the soil. 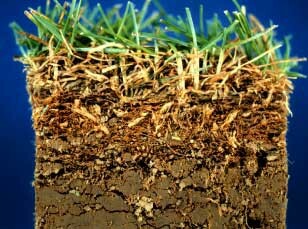 If a layer of thatch becomes too thick, it prevents the necessary components from adequately dispersing amongst the new grassroots. The reason thick thatch prevents healthy growth is that it’s more resistant to decomposition than usual. Not only does it inhibit growth, but it can increase pest problems. According to Peter Landschoot, Professor of Turfgrass Science at Penn State University, thatch can be caused by a number of different things. It can be caused by regular walking on the grass, causing compaction. It can also be caused by certain types of grasses, low ph levels in the soil, certain fungicides and insecticides, and aggressive fertilization. One of the most effective methods of controlling the thatch levels is aeration. Aeration is a mechanical process of making little holes in the turf. This process penetrates both the grass and the thatch layers. Creating space for oxygen, water, and nutrients to bury deeper in the turf. On top of managing thatch, a lawn aerator loosens soil and supports deeper root growth by allowing oxygen into the ground. All of which combine to encourage healthy grass. Before you begin the process of eliminating thatch, mow your lawn as low as your mower allows. There are two main types of lawn aeration: core aeration and spike aeration. If you golf, you’ve probably seen a golf course green with hundreds of little holes. This is because they just finished aerating. Core aeration pushes hollow tubes into the turf and removes small plugs and leaves them on top of the grass. Spike aeration is similar, but it pushes solid spikes into the ground to make holes without pulling up turf. We recommend core aeration because spike aeration can cause extra compaction over time. Another primary method used to control thatch is dethatching. This is often confused with aeration, despite being entirely different. Dethatching can be done with a machine or by hand. While there are several different types of dethatching machines, they all use rotating blades that dig into the thatch and pull it to the surface. Dethatching by hand is similar to raking and is less effective than dethatching machines. If you’re not sure how thick your thatch is, there are a couple of different inspections you can do. First, you can do the step test. If you walk on the grass, does it feel spongy? Do you feel as though you sink with each step you take? If so, it’s probably time to cut down on some of the thatch. If you’re still not sure, you can do the eye test. If you cut a 6-inch square out of the turf, you’ll be able to see for yourself. If your thatch is larger than 1/2 an inch, you should consider removing some of it. It’s not necessary to dethatch your lawn every year, but it’s smart to aerate your yard annually. Aeration does more than reduce thatch layers and your lawn can benefit from the consistency. It’s best to do this during a cooler time of year. Many experts will recommend either the spring or the fall. Depending on where you live, we prefer to aerate in the spring, mainly because the winter can have several adverse effects on a lawn. I had the chance to talk to Dr. Rodney St. John Ph.D., Director of Agronomy and Environmental Stewardship at Ryan Lawn & Tree in Overland Park, Kansas. 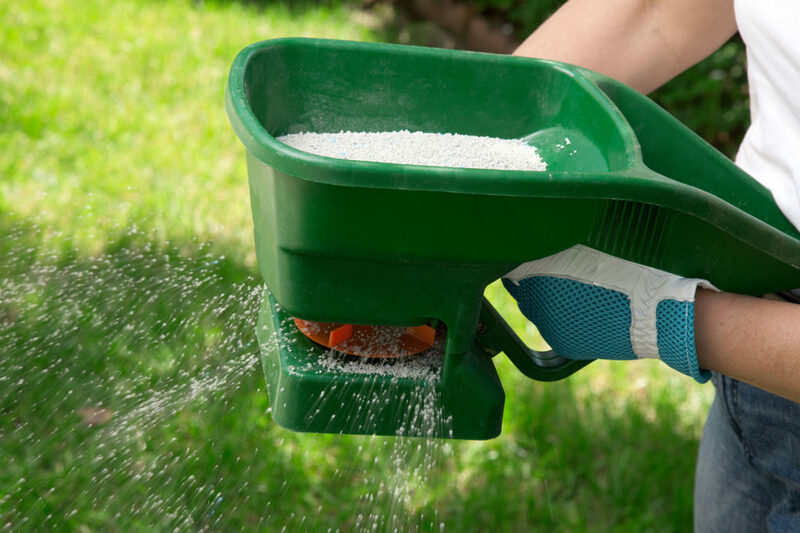 When it comes to fertilizing, you must first choose the lawn fertilizer that’s right for you. If you go to the store, you will see that fertilizer bags have three numbers on them. This number is referred to as the NPK, which is the percentage of Nitrogen, Phosphorus, and Potassium that is in the mixture. When you’re at the store, look for slow release mixtures. If Nitrogen releases slowly, the grass won’t grow as quickly. Also, be sure to stay away from garden fertilizers for your lawn. These are typically quick release, and your lawn won’t benefit from them as much as they will from lawn fertilizer. Now that you have chosen a fertilizer, you need to schedule when and how often you will lay it down. For cool-season lawns, 1 lb. of Nitrogen is recommended per 1000 sq. feet of grass every application. Dr. St. John recommends laying down fertilizer 3-4 times per year. Once in March (or later if you have a winter like we did this year), once in June, again in September, then one more time in November. Every application should be slow releasing formula except for November. The November application should be a quick release. It doesn’t matter what time of day you lay down fertilizer. It’s recommended that you do it before watering and on a day that you won’t be mowing. To apply the fertilizer, you can use what is called a rotary or a broadcast spreader. This is a tool that evenly spreads the mixture with a rotor. You can also use a drop spreader, but this isn’t as efficient at spreading the fertilizer around. Dr. St. John suggests filling your rotary spreader with only half of your needed amount and spread it by walking back and forth. After that, take the other half of your fertilizer and spread it back over the lawn in perpendicular lines. This will ensure that you cover the entirety of the plot, with less room for error. Overseeding is a word that has a somewhat negative connotation. It’s sometimes mistaken for accidentally applying too much seed. Overseeding is actually one of the most important steps in the process, and many people forget about it when it comes to lawn care. Overseeding is the process of spreading seed over thinning areas of turf. It can happen either before or after you spread fertilizer. This enhances the look and color of a lawn. It will help give off that full, green look every homeowner aims for. If you choose to overseed, you need to be sure that the seed you are using is the same species of grass that you currently have. Once you have your seed, you can use the same broadcast spreader that you used to spread the fertilizer. When you finish spreading the seed, sprinkle a light amount of water on top. It’s pretty apparent when a lawn is thirsty. It’s easy to understand when grass is in need of water. Watering the grass is a little more complicated than just turning the sprinklers on and letting them go. It’s important to know how much water a lawn needs, when to water it, and how often. Consistent watering is a crucial component of a lawn care regimen. With watering a lawn, it’s about keeping your grass healthy while keeping your bills low. A widely accepted rule of thumb is one inch of water per irrigation event. This should be done once or twice a week in the Spring and every 2-3 days in the summer. 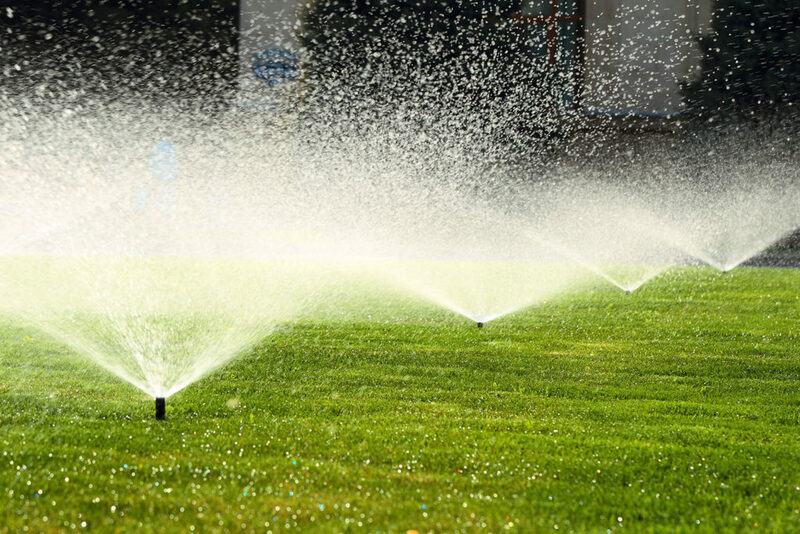 If you have a sprinkler system, it’s relatively easy to determine how much water you are using. If you are using hose attachments, it can be more difficult. Scotts, a fertilizer company, says to use the can test. To test for water, place some empty tuna cans around the yard. After your sprinkler cycle, measure the amount of water in the can using a ruler. This will give you a general idea of how much water you are putting on your lawn. When watering, you want to be as efficient as possible. Some areas require more water than others. Areas that are in direct sunlight will need more water than those that are in the shade. Hills also need more water due to the runoff. It’s also smart to keep the weather in mind. When scheduling your sprinklers, take a look at the weather forecast. There’s no sense in running your sprinklers if it’s going to be raining. Watching the weather will help save money and prevent overwatering. Another option will be a rain sensor for your underground irrigation system. If it’s possible, overwatering should be avoided. A little extra water probably won’t hurt your lawn, but too much can drown the grass seed and roots. Grass does not need a lot of water to grow. Watering should always be done in the morning. The optimal time is between 6:00 AM and 10:00 AM. This gives the soil plenty of time to absorb the water. Then the sun comes out and jumpstarts the growth process. If you water in the middle of the afternoon, the heat can dry out the moisture before the soil has a chance to soak it up. If you water in the evening or at night, the humid air can promote disease growth and damage your lawn. Also, know your city ordinances or neighborhood rules. While unofficial, some cities and neighborhoods have certain times when a house is allowed to water their yard. I once lived in an area with watering rules. Odd numbered homes were only allowed to water on Monday, Wednesday, and Friday. While Even numbered houses watered on Tuesday, Thursday, and Saturday. When it comes to mowing the yard, we all claim to be experts. My father put me behind the bar of a Honda push mower at a young age. By the time I was twelve, he had sat me down on a Grasshopper riding lawn mower with a 36″ deck. Since then, I have operated John Deere, Kubota, and Toro riding mowers. Despite my thousands of hours of experience (personal claim), I doubt I know everything. But I do like to think… how many blades of grass have I cut in my lifetime? I would say it’s a significant number. You already got your mower ready for the season by replacing the gas, changing the oil, sharpening the blades, and changing the spark plug. There’s one more step before you can get started. 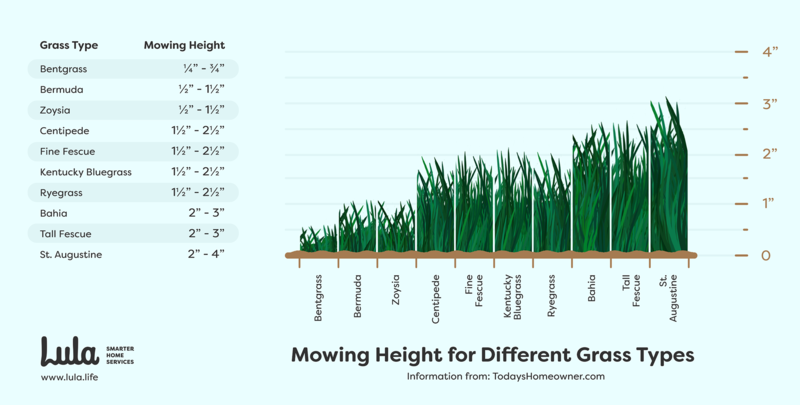 You should adjust the height of your lawn mower to match your type of grass. Mowing too low can kill your lawn, leaving brown spots and making it more susceptible to disease. If you mow to low, you can scalp the lawn, which is the reason for the brown spots. We took some information from Julie Day, of Today’s Homeowner, and turned it into this graphic. This might seem like common knowledge, but many homeowners don’t know that there is a specific time of the day that a yard should be mowed. If you mow too early, your grass may still be wet from the dew, which can cause clumping under your mower deck. If done in the middle of the day, the grass can dry out and die due to the heat. 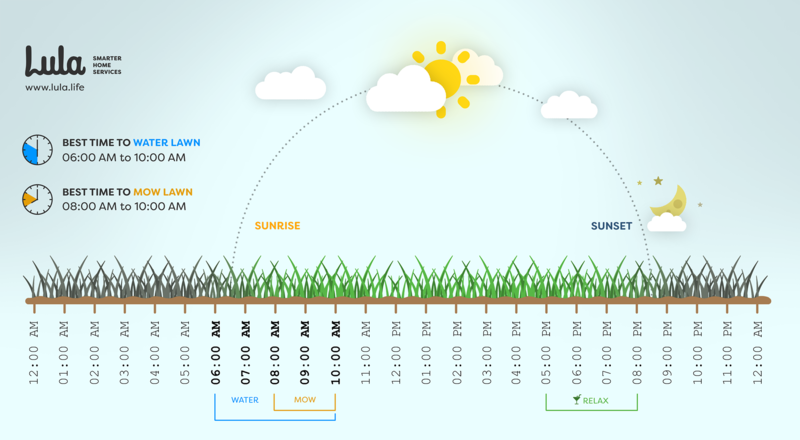 Later in the evening is okay, but if you mow in the mid-morning, the turf will have adequate time to absorb moisture without drying too quickly. The best time to cut grass is between 8:00 AM and 10:00 AM. If you have a watering schedule set up, plan to mow on an off day. Like the morning dew, watering before mowing can cause grass to clump up. Thus, creating a rough cut and a poor looking lawn. A frequently asked question is whether or not a person should bag their grass clippings or leave them. Our answer: leave them. Grass clippings can actually serve as a secondary fertilizer. If you hate the look of grass clippings on your yard, bagging them won’t kill your lawn. Bagging grass just takes extra effort that is necessary. Have you ever been on one side of the house and had to walk all the way around to the other side to empty the bag? It’s even worse when you’re on your last little patch. While you’re mowing, be sure to go slowly. If you’re going too fast, you’ll notice. The blades will end up missing some patches of grass, leaving your lawn looking uneven. Please be careful, because mower accidents are preventable. How often should you be mowing? Well, that depends on a number of factors. It will depend on your grass type, weather, how much water your grass receives, and how well you maintain your lawn. Some lawns will require twice per week or once every couple of weeks. Generally speaking, once a week should be enough for most lawns. Match the mowing frequency with the rate of grass growth. In the spring, cool season lawns might need to be mowed every 4-5 days whereas in the summer they may only need to be mowed every 7-10 days. The opposite is true for warm season grasses which grow rapidly in the summer. Each time you cut, alternate directions. If you mow vertical one week, cut horizontal the next. You can even spice up your patterns. You can mow in spirals, squares, or diagonally. The reason you want to change patterns is to avoid compaction. If you mow the same direction repeatedly, your turf will eventually compact. It also promotes an even growth. Admittedly, I’m not the only person who finds mowing a lawn to be therapeutic. Giving a healthy lawn a fresh cut is one of my favorite chores. The smell of freshly cut grass mixed with the mid-morning air is sure to kick-start a day. Research has even shown that the smell of freshly cut grass can reduce stress. On top of that, maintained lawns are easier and more satisfying to cut. It’s hard to beat the feeling you get when you look out over your green lawn. Caring for your lawn is one of those things that requires attention. 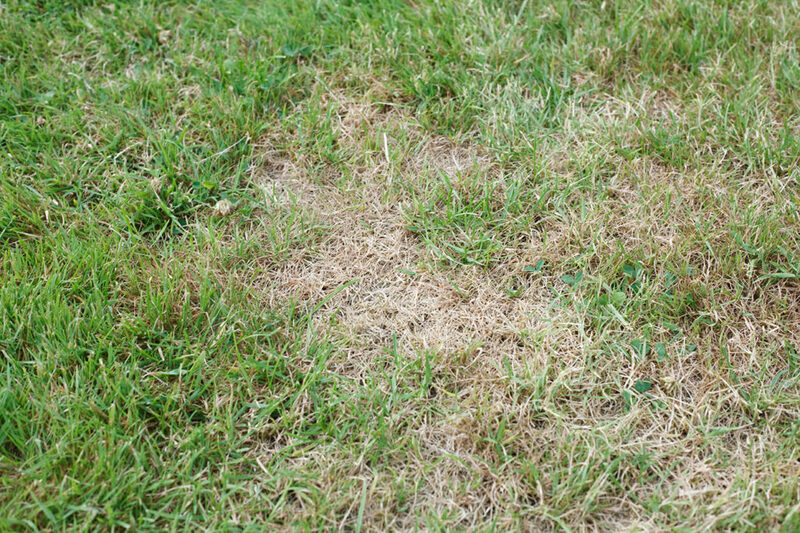 If you aren’t paying attention, you can miss something that can potentially harm your lawn. You need to keep your eyes open for discoloration, fungus, pests, and weeds. If these go unnoticed, repairing the damage can take longer than it should. Here are some of the enemies that you need to fight off your lawn. The goal is to get rid of weeds without killing your grass. The first option for weeds is pulling them. If you decide to remove them by hand, be sure to grab low on the stem and try to remove the entire root. It’s important to remove the whole weed and not just the top portion. If that doesn’t work, you might need to resort to herbicides. Once you spray an area, you should be able to uproot the weed easier. It’s unfortunate that even our lawns can be ravaged by disease. When this happens, it usually has something to do with our lawn care program. There can be many different factors, ranging from over-fertilization to irrigating at the wrong times. Luckily, yard diseases have treatments. Check out this guide put out by the University of California Agriculture & Natural Resources. We generally encourage nature to take its course in your yard. Many insects are beneficial to your yard and insecticides can mess with that balance. We realize that there are some circumstances that require the removal of insects. Grubs are the most dangerous insect for your lawn, but mosquitos and ticks are two types of insects that we can’t stand. We are all for getting rid of those evil bugs. Like most things, choosing whether to do it yourself or hire someone will come down to money. Even if you enjoy caring for your lawn, it can be expensive. If you don’t already have the equipment, it might be best to hire a lawn service. They are professionals, so it’s guaranteed that they are going to do a good job. If you want to split the work, you can do all of the fertilizing and watering yourself, while hiring one of the local high school kids to mow your lawn. There’s a joy to be felt in creating a beautiful lawn. Lawn care is an ongoing, long-term commitment. After the time, money, and energy is invested, you can look out over your grass and feel accomplished. A lawn is a public proclamation that shows people around you that you care. A great lawn has the power of making people do double takes. It increases the value of the home just by curb appeal. A pretty lawn even attracts more presents from the neighborhood canines. Have any other questions? If you leave them in the comments, we would be happy to answer them! I have recently started my own lawn care and maintenance service and I came across your page. This is really useful information that any homeowner should definitely learn about! Not only do you have great knowledge in regards to lawn maintenance and the different tools needed but you’re also a great writer. Great content, thanks a ton! Thanks, Victor! I wish you the best with your lawn care venture. If you have any tips you would like to add, feel free to add them in the comments! Always great to hear from other professionals. I didn’t realize that grass can build up in the bottom of a lawn mower and cause problems with the blades. This makes me wonder if this has happened to my lawn mower because it is no longer working properly and makes a high-pitched noise. We will start looking into lawn mower repair services. It’s an easy problem to fix. If you take out the spark plug, you can flip the lawnmower over and remove the buildup yourself. 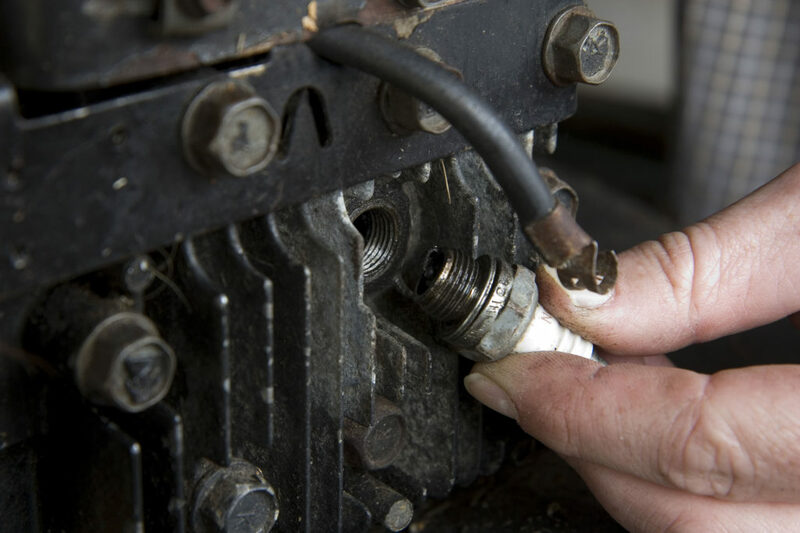 It only takes five minutes to do, just make sure you remove that spark plug before you start. Removing the spark plug guarantees safety when working around the mower blades. Wow, such a thorough and informative article. Being a new homeowner (since July) and starting a new landscape company, this was so helpful for me. I didn’t know you could overseed, and I love the tips on preparing the lawn mower before use. Very, very helpful info and also great looking infographics! You’re a great writer and it was an easy and quick read. Thanks again! Thanks, Jack! I appreciate you taking the time to read through the article. When I was in lawn-care, cleaning the bottom of the mower was an important part of my week. Regular cleaning can help the mower cut more efficiently. This article is so comprehensive and everything is laid out perfectly. Here in the south, the type of grass is so important to achieve a healthy lawn. I especially like the DIY or hire section, some individuals have all the necessary tools and knowledge and others either don’t or don’t want to! Thank you for this extremely informative article! Thank you! Sometimes it’s better to hire somebody rather than taking the time to DIY. But some people love DIY! There’s a sense of accomplishment that comes from perfecting a lawn. Awesome read! I recently started a lawn care service and always thought overseeding was a negative connotation. Thank you this content is helpful for not only home owners but business owners in this field.